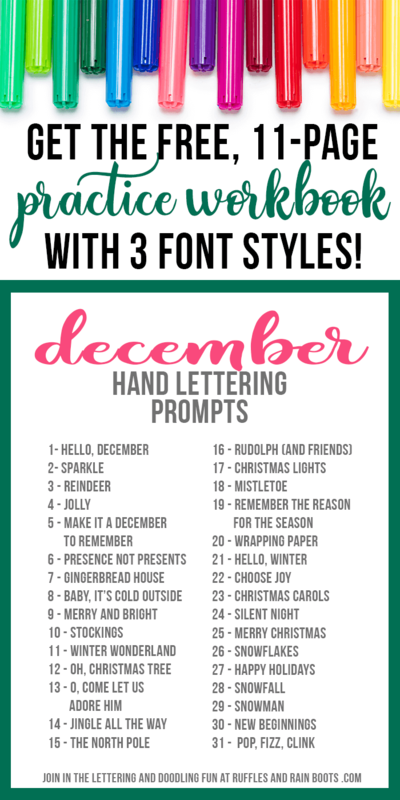 Download these free Decemmber hand letter practice sheets and prompts. Work on brush lettering, bounce lettering, and modern calligraphy styles! 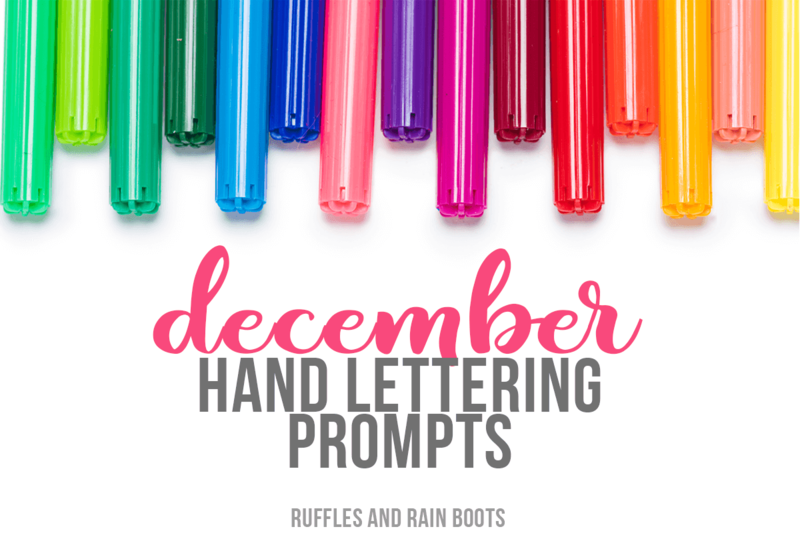 We’ve gotten to the final month of our daily prompts and monthly hand lettering practice. Amazing! But we’re far from done. You know by now that practice is progress in this fun hobby. This month, we’re focusing on all things wintry, merry, and bright. I have one bold, vintage script and two fun prints for you – it’s so important to practice those non-script fonts, isn’t it? In every art print, I incorporate at least one style, even if it’s just to attribute a quote. Whether you’ve been lettering a while or you’re a beginner hand lettering fan, everyone can benefit from practice. 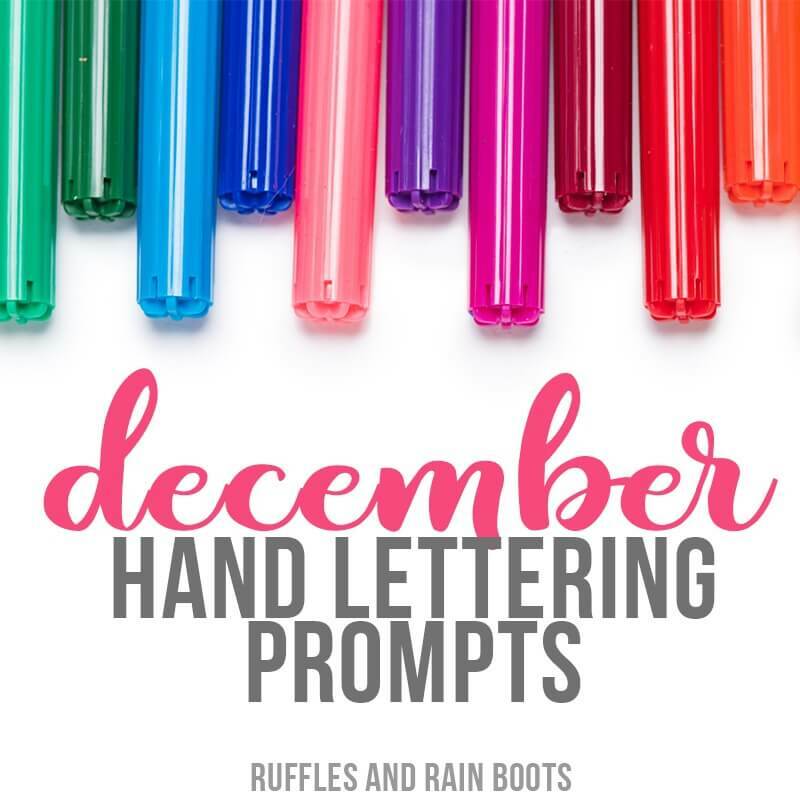 And here at Ruffles and Rain Boots, we share a LOT of free hand lettering practice! Print the prompts and practice sheets out and gather a couple of items to really get the most out of your practice session. Note that these are large pen alphabets this month but I practice them with both large and small pens. If you are subscribed to our newsletter, you already have the password (it’s at the bottom of every email I send). Grab that password and get the December Workbook here. RELATED READING: Mermaid Hand Lettering – Let’s Make Practice Fun! Your shares are how this site grows and both my family and I are sincerely grateful.